Abcam’s IL-10 Human in vitro ELISA (Enzyme-Linked Immunosorbent Assay) kit is designed for the quantitative measurement of IL-10 in supernatants, buffered soloutions, serum and plasma samples. A monoclonal antibody specific for IL-10 has been coated onto the wells of the microtiter strips provided. Samples, including standards of known IL-10 concentrations, control specimens or unknowns are pipetted into these wells. During the first incubation, the standards or samples and a biotinylated monoclonal antibody specific for IL-10 are simultaneously incubated. After washing, the enzyme Streptavidin-HRP, that binds the biotinylated antibody is added, incubated and washed. A TMB substrate solution is added which acts on the bound enzyme to induce a colored reaction product. The intensity of this colored product is directly proportional to the concentration of IL-10 present in the samples. This kit will recognize both endogenous and recombinant Human IL-10. Get results in 90 minutes with Human IL-10 ELISA Kit (ab185986) from our SimpleStep ELISA® range. Our Abpromise guarantee covers the use of ab46034 in the following tested applications. IL-10 detected in supernatants from control cells (C) or cells stimulated for 24 hours with 50 ng x mL-1 of PMA (ab120297), with the addition of 1 ug x mL-1 of LPS (Sigma) (P/L) for the last 6 hours. PBMCs were stimulated for 48 hours with 2 % PHA-M (LifeTechnologies). Results shown after background signal was subtracted (duplicates +/- SD). Publishing research using ab46034? Please let us know so that we can cite the reference in this datasheet. 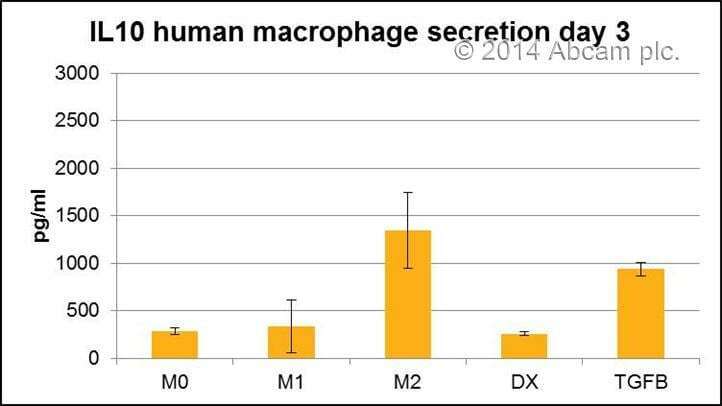 IL10 secretion by human macrophages isolated by negative selection in culture for 3 days.